Note: 2CD Deluxe Edition w/ bonus track "Old Dreams Waiting To Be Realized"
The Knife return after seven years with an album that is more like a sword than any knife I could imagine. Haunting and exotic electronic sounds from planets unlike ours could have never came up with what emits from this release. 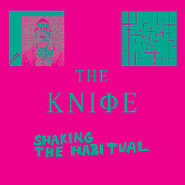 As always, The Knife mean to disturb and provoke you, and Shaking the Habitual represents their most adventurous statement to date. They begin the two-disc set with one of the more pop-oriented pieces — of course, The Knife’s defintion of pop involves alien distortion on Karin Dreijer Andersson’s vocals, which are growly and swoop in and out of conventional melodicism to begin with. On “A Tooth for an Eye,” it’s fairly typical, if highly accomplished, fare for The Knife, as Andersson’s warped vocals match her and Olaf Dreijer’s tribal beatwork and synths that bellow and squelch like steam machinery. This in no way prepares you for the set’s second song, the nine-minute “Full of Fire,” whose machine-gun beats are the accessible part of a demonic pop song in which synths bleep atonally like tea kettles and swirl like locusts, while Andersson’s vocals sound like they’ve been run over by tires full of syringes. Even with its mammoth run-time and demanding sound, it never falters in fascinating and keeping a fanged vice grip on the listener. You feel your hair stand on end and you start to sweat with each new turn. “A Cherry on Top” starts with five minutes of airy synths and clanging instrumentation before Andersson comes in with a digitally deepened voice in a sort of gender, culture, genre-bending near 10 minutes that’s both bewildering and bold. Of course The Knife’s freaky sounds can be grating or seemingly unusual for the sake of it sometimes — I opened a hotel website with a man singing in Hawaiian during the flute-laden “Without You My Life Would Be Boring” and didn’t notice for a full minute — and pieces like the nearly silent, nearly 20-minute “Old Dreams Waiting to Be Realized” are more interesting in concept and as a breather than they are in actual sound. But Shaking the Habitual harkens back to a time when albums were meant to be an experience, something puzzled over, abandoned and returned to and studied, not streamed while searching for hotels. It’s anti-pop, but claims that it is “unlistenable” are unfounded. Even at nearly 10 minutes and with truly messed up sounds housed within in, “Raging Lung” is a pop song, with movements and parts that hit you and break through the din — when Andersson keeps coming in with her “that’s when it hurts” line ranks among the best pop moments on the album. “Networking” drops vocals almost entirely in favor of a Kraftwerkian cold synth rave-up, and it ends up one of the album’s catchiest songs in the process. “Stay Out Here” also features guest vocals from Light Asylum’s Shannon Funchess and artist Emily Roysdon that make the song a kind of horror house anthem as the singers’ vocals bounce off one another and come together in eerie harmony in a padded cell of wavelike synths and skittering beats. The Knife make many demands on you — of your time, of your patience and of your willingness to let go of preconceived notions of pop — on Shaking the Habitual. Trust them — you’ll emerge from the experience feeling as though you’ve gained a new understanding of what pop music can be. Few artists alive today can claim the same effect.